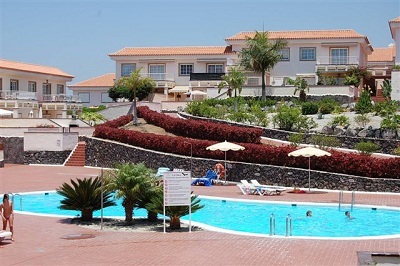 This two bedroom penthouse is situated in the Aguilas del Teide complex in Chayofa, in Arona. The complex has 2 communal pools: an adult and childrens' pool. The living room consists of a comfortable seating area and satellite TV with international channels. The American-style kitchen is well equipped with oven, hob, microwave, fridge/freezer, toaster, kettle, coffee machine and a breakfast bar and stools. There are two bedrooms, one with a double bed and one with twin bedrooms. There is a safety deposit box in one of the bedrooms. There are patio doors off the living room which lead out to a balcony which is furnished with a table and chairs for alfresco dining. The balcony has sea and mountain views from here.